Talk about a transformation. 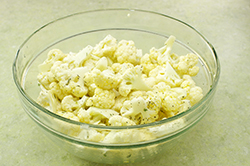 Starting point: pale, crumbly, bland raw cauliflower (my apologies to any grocery-store salad bar designers). Process: toss with olive oil and roast for 20 minutes. 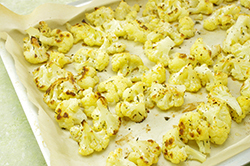 End result: golden, moist-chewy, sweet cauliflower that you never dreamed was possible. Roasting is the best method for this vegetable, and drizzling with a sprightly green sauce just makes things better. Heat the oven to 425°F/220°C/gas 7. 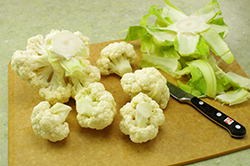 Don’t worry if when you cut the cauliflower into florets, you end up with a few smaller ones. They will create delicious crispy bits. 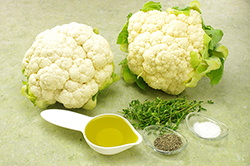 In a large bowl, toss the cauliflower with the olive oil and thyme and season generously with salt and pepper. 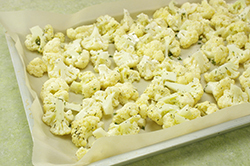 Spread the cauliflower on one or two large rimmed baking sheets. Roast until the florets are tender, collapsed, and golden brown on their cut faces and around the edges, at least 20 minutes and possibly longer. The darker the cauliflower the better it will taste (short of burnt, of course). 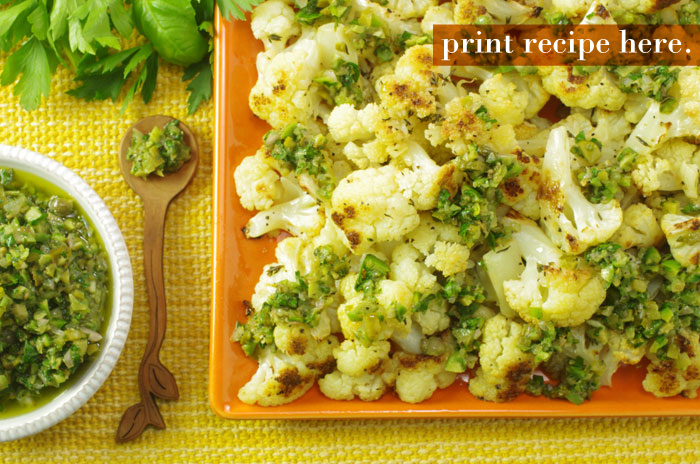 Pile the cauliflower into a warmed serving bowl and drizzle generously with the sauce. Serve warm or at room temperature. This herb-based sauce, which you’ll see in many permutations, is looser and more tangy and briny than a pesto and doesn’t call for cheese. 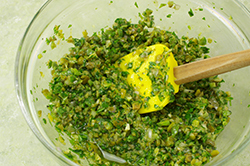 In France, you’ll see it called both sauce vierge and sauce verte: vierge (virgin) because there’s no heat applied to it . . . hmmm . . . and verte (green) because it is green, bien sûr. Other cuisines have a similar sauce, so this version is just my mash-up that incorporates a bit of everything. The idea is to go for zing. 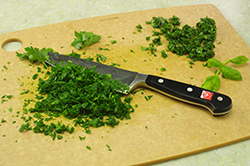 If you enjoy using a knife (and I hope you do – it’s meditative! 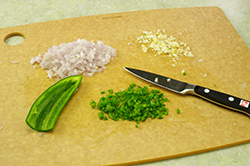 ), You’ll love this sauce because you chop everything by hand for the best texture. 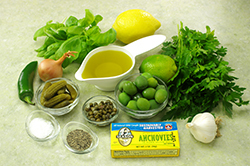 In a bowl, toss together the parsley, basil, olives, cornichon, shallot, capers, chile, lemon zest, anchovies and garlic. 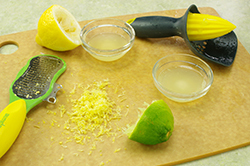 Stir in the olive oil, and then stir in the lemon and lime juices. 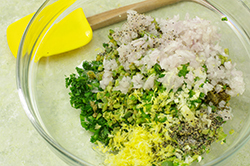 Taste and add enough salt to make the sauce highly savory (the amount added will depend on the saltiness of your other ingredients) and season with several grinds of pepper. Let the sauce rest at room temperature for 30 minutes to allow the flavors to develop, then taste and adjust the seasoning again with salt, pepper, and the citrus juices if needed. Refrigerate until you’re ready to use it. STORAGE: This sauce is best if served within the hour, but it can be refrigerated in an airtight container for up to 2 days. This sauce doesn’t freeze well. 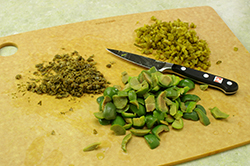 QUICK CHANGE: Fold in 1/2 cup/85 g peeled, seeded, and finely diced tomato. Add some fresh mint and/or tarragon with the other herbs. Add some finely chopped hard-cooked egg just before serving. Swap out the fresh chile for a pickled pepperoncino. Reprinted with permission from Modern Sauces by Martha Holmberg. Copyright 2012. Published by Chronicle Books, LLC, San Francisco, CA. Gray Goose Cookery | Olde Mistick Village | 27 Coogan Blvd | Mystic, CT 06355 | Copyright 2014 - Acorn Advisors | Gray Goose, Too!